If you like the mod and want to make a donation Click here, Thanks. The content of this changelog may change over time until release. - Toolbar button edges have been removed, Less is more ! - A new set of icons have been created for The Fountain Mod. * Expendable toolbars have a distinct gold arrow on them. * Food toolbar: Fountains are now at the end of the food list. * Castle and Custom Castle kit are now available inside a new tab called Elaborate and Wonders. * Fountain mod Housings are now categorized on sub toolbars inside the Housing Toolbar following the vanilla houses. * Perimeter decorations: Flower beds, Hedges and fences are now accessible through Perimeter inside Decorations main tab. - Distillery is now located at the end of Services Toolbar. - Market stalls now need 25 coins per tile used to be built. *Two sided stall cost a little extra resources. - Placing the first stage of a market stall costs only wood, setting them up into point of sale will required extra materials. - Placement arrows are now oriented the corect way for one sided small stalls when placings them. - Resource Exchange: Fixed the tile that was not buildable on road. - Castle, mountain Castle and custom castles textures have been redone and are now higher quality. Warning: Due to some changes some building may have building issues if played with a saved game from a previous version. - Structures that can be construct inside other structures areas where tiles are buildable now have a destroy button inside their Gui. - Some contructions can be built inside other structures buildable areas. - Decorations can now placed anywhere by respecting the game grid. - A new tool to add collision: this tool when applied will restrict citizen to pass through decorations. * This tool is visible as a decal on the floor by default, Enable Invisible Add Colision mod when playing to make them invisible. 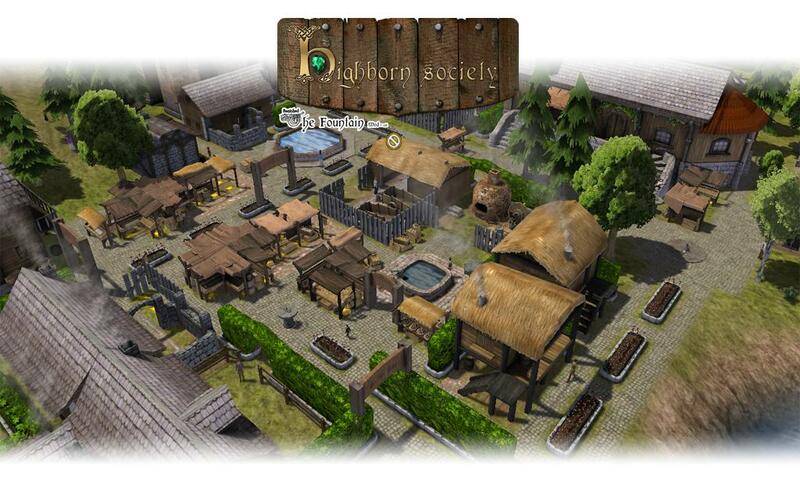 - A new button is available inside Gui of Hedges, decorations and small market stalls to rid of them. - A new tab for decorations is accessible inside custom market tab containing all market decorations. - Iron is now needed to craft Blueprint. - Extra slot when selecting a building who is not constructed. - Fixed Extra required material on Toolbar Tip and when picking. - Global: Fixed Blueprint small icon that was not appear correctly. - Global: Fixed Herb icon small that was not appear correctly. - Crash when selecting an unbuilded Market sign. - Market stalls can now be build inside building building perimeter if the tile is buildable. - Market decorations (Crates, gates) can now be build inside building building perimeter if the tile is buildable. - Flower Beds decorations (Crates, gates) can now be build inside structure perimeter if the tile is buildable. - Edges can now be build inside building building perimeter if the tile is buildable. - Fountains can now be build inside structure perimeter if the tile is buildable. - Decorations can now be build inside structure perimeter if the tile is buildable. - Barrel decoration is now available through custom market decorations tab. - 2x1 Hedge does no more give happiness. - Custom Castle kit no more gives happiness. - Decorative fountains does not give happiness anymore. - Castles can now correctly hire Nomads. - Water is now considered non drinkable until treated by the Distillery which will give Clean Water. Note: To be effective, you need to start a new game.